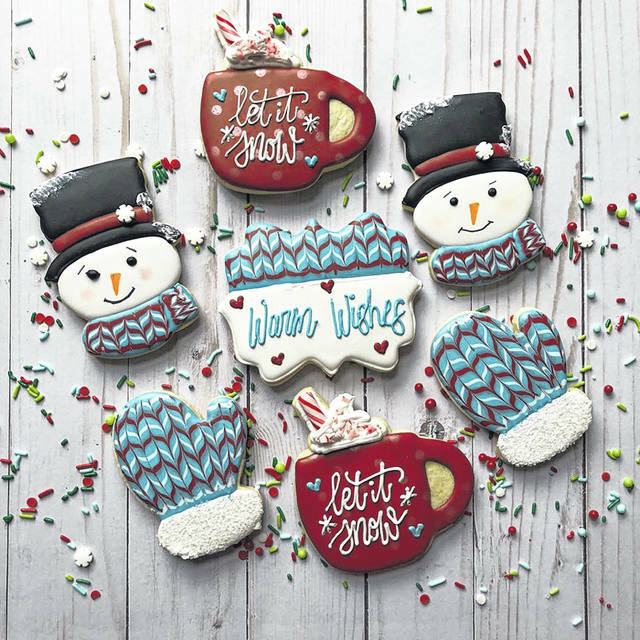 Pictured are some of Cannon’s winter-themed cookies. 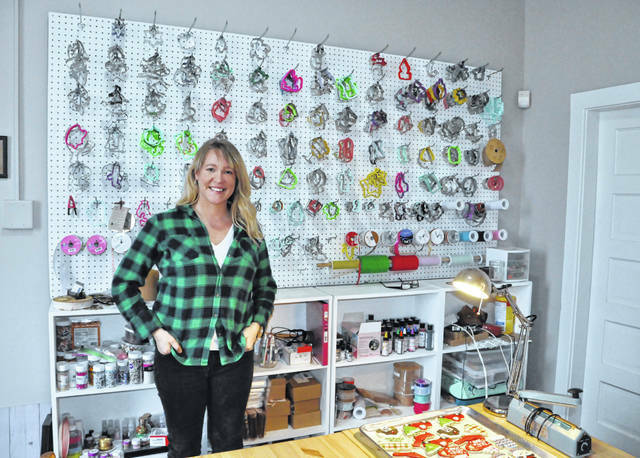 Sarah Cannon, a Delaware County native and owner of Sarah Jane’s Custom Cookies on East Winter Street in Delaware, stands in front of her large assortment of cookie cutters. Cannon runs her cookie business out of her downtown loft. For some people, living in sunny San Francisco and working in corporate America would be a dream come true. For others like Delaware County native Sarah Cannon, nothing compares to living and working in small town USA. Cannon, who grew up in the village of Sunbury and graduated from Big Walnut High School, decided in 2009 after graduating with a degree in textiles and clothing from The Ohio State University that she was one of those individuals who wanted to head out west in pursuit of a successful career in the corporate world. She would find just that, but she would also discover along the way it wasn’t the life she was destined to live. The kind of life Cannon is referring to is what she is doing today — making her own schedule as a small business owner in her native Delaware County. While working in California, Cannon had an inkling she was meant to do something else with her life, so she saved up money for a couple of years and headed off to explore the world and discover herself along the way. Having felt the itch for quite some time to see if she could make a living as an entrepreneur, Cannon decided to take a leap of faith upon her return to the States. Upon her return to America, Cannon tossed around numerous ideas for a startup business. She decided on a product that’s enjoyed by many Americans, young and old — sugar cookies. In fact, she experienced instant success after setting up a cookie business in her studio apartment in California. Circumstances, however, led Cannon to move herself and her cookie business to Austin, Texas, where the business continued to make a name for itself. After spending some time down south, Cannon came to the realization that if she wanted to sustain her business, there was only one location that made since — home. Just before the holidays last year, Cannon made the move back home to Delaware County, and this past February, she filed for limited liability company (LLC) status as Sarah Jane’s Custom Cookies, which she operates from her loft on East Winter Street in downtown Delaware. Immediately, Delaware County welcomed Cannon’s business with open arms, or in this case, by opening up their wallets and pocketbooks. She added when locals see her cookies for sale on her website or during the local farmers’ market, they have one question in particular for her, and it’s an important one for cookie connoisseurs. To be making a living in Delaware is icing on the cookie for Cannon. Cannon also enjoys the life she is able to live with no 9 a.m. to 5 p.m. schedule staring her in the face five days a week. For those wondering what type of treats are available at Sarah Jane’s Custom Cookies, Cannon keeps it simple. During the holidays, rather than doing 40 to 50 different custom orders, Cannon offers her own holiday-themed designs in multiple options: ready to eat cookies in various quantities, do-it-yourself cookies (pack includes baked cookies along with bags of icing and sprinkles) and paint-your-own cookies. During other times of the year, Cannon turns her focus away from holiday cookies and more toward custom orders for events like weddings, bridal and baby showers, and birthday parties. To learn more about Sarah Jane’s Custom Cookies or to place an order, visit www.sarahjanescustomcookies.com. Cannon, who said she won’t be accepting anymore orders until after the first of the year, also offers cookie decorating classes from time to time, which she announces on her “Sarah Jane’s Custom Cookies” Facebook page. Contact Joshua Keeran at 740-413-9000. Like The Gazette on Facebook.